Do you ever pretend that you are dead to get out of going to school? Do you like to ring up people you know and pretend to be someone else? Do you leave banana skins in the middle of busy footpaths? Do you own any of the following items: fake dog poo, rubber vomit, gorilla suit? Do you wish that every day could be April Fool's Day? Score: One point for each 'yes' answer. 3-5 You are a practical joking genius. You will love this book. 1-2 You are a good practical joker. You will love this book. 0 You are not a practical joker. You are what practical jokers call a 'victim'. You will love this book. 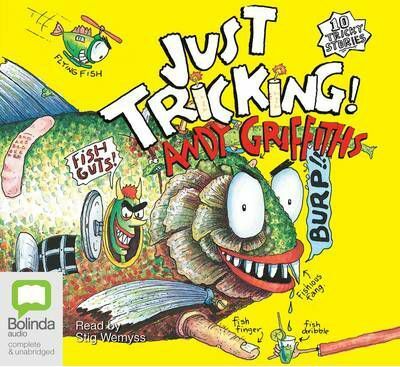 Andy Griffiths is one of Australia's funniest writers for children. His books have sold over 4 million copies worldwide, have featured on the New York Times bestseller lists, and have won over forty Australian children's choice awards. Andy lives in Melbourne, Australia. Stig Wemyss is an actor, writer and the voice behind millions of children's audiobooks. Well, not millions. Thousands ... alright, more like hundreds ... he has a huge fan club. Bolinda audio is constantly receiving letters from kids saying things like 'Stig rocks' and 'I love Stig' and 'Stig Wemyss is the best narrator in the world'. Of course we don't show Stig all these letters, as he already thinks he's the best narrator in the universe! Stig is also the author of the exciting in-car audio entertainment series, The Tripp Diaries, so now he thinks he's the best narrator and the best author in the universe. We think he is too, but let's just keep that to ourselves.